Grey Greenough, 2, has always been a little guy, but don’t be fooled – he has learned to have a big appetite. During his first few months of life, Grey was diagnosed with laryngomalacia, or floppy vocal cords, when he was just 3 months old. His symptoms, however, appeared almost right after birth. He had reflux and struggled to latch properly while breastfeeding because of a tongue tie, according to his mothers, Jessica Pennell and Sarah Greenough, of Stow, Massachusetts. 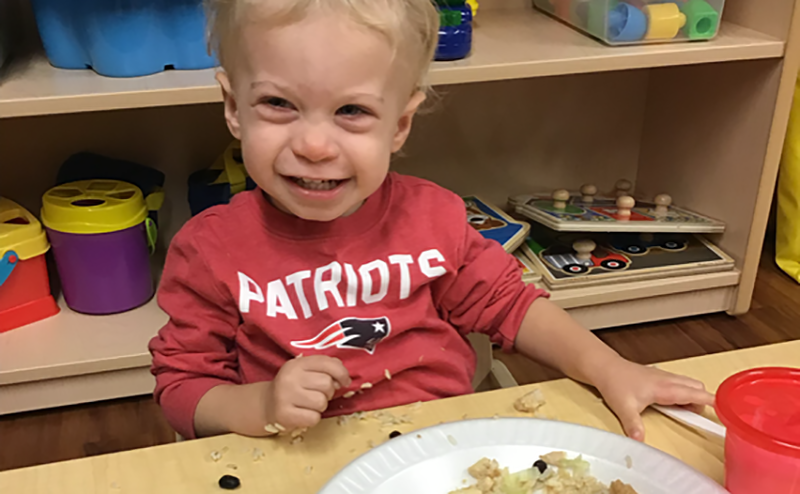 At 2 months old, Grey and his family arrived at MassGeneral Hospital for Children (MGHfC). At MGHfC, Grey’s care team grew to include multiple specialties, ranging from Pediatric Feeding and Nutrition to the Pediatric Airway, Voice and Swallowing Center at MGHfC and the Massachusetts Eye and Ear Infirmary. Amid the many appointments and referrals, Jessica and Sarah remained flexible and open to suggestions, focusing on their son’s long-term health when times were tough. This story first appeared in MGH Hotline.